Fire detection systems developed for high-risk industries. Selecting the right fire detection system is key, with early detection playing a key role in minimising the damage caused by a fire. We work with a broad spectrum of fire detection system manufacturers from across the world, using our expertise to find the perfect solution for your business. Fill in our contact form to discuss your needs with our team of fire protection specialists. Thermal imaging systems detect subtle changes in temperature, alerting you when action is required and acting automatically to de-escalate the situation as quickly and effectively as possible. By reacting to more subtle changes in temperature, thermal imaging detectors can alert you to the risk of a fire developing much earlier than alternatives, giving you crucial time to react accordingly and minimise damage. 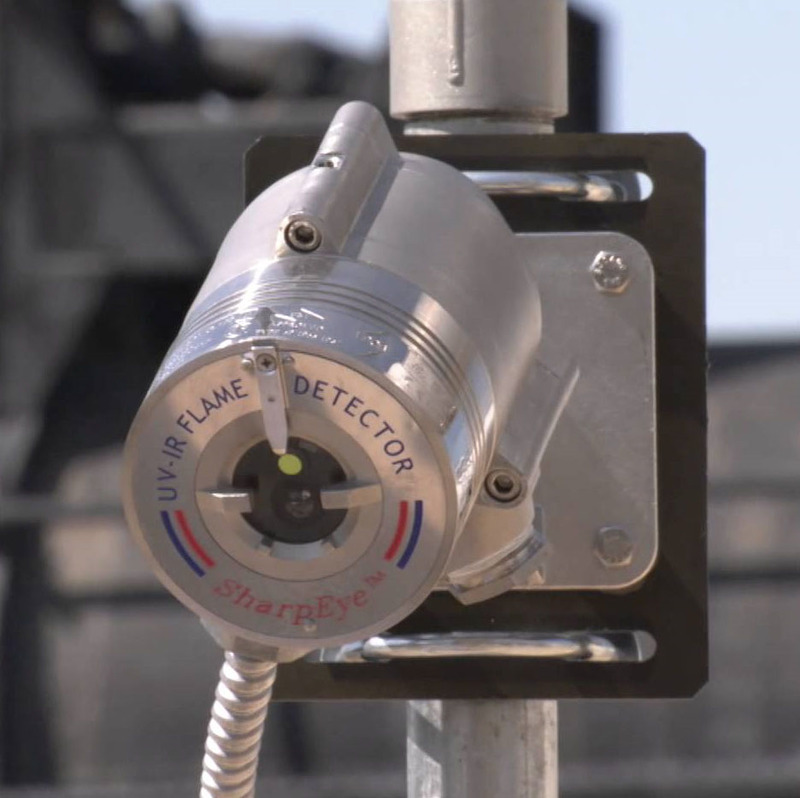 A flame detection system will detect the presence of a flame and react accordingly, from sounding your fire alarms to activating fire suppression systems. The mechanisms used to detect flames can make flame detectors faster to react than smoke or heat detectors. Saving time in a situation where every second is vital. Spark detectors are vital in industries which commonly produce dust and sparks and are commonly used in the ducting process, which takes raw material from one part of a machine to another. In this situation, a rogue spark could be enough to cause an explosion and severe damage. Spark detectors immediately detect sparks in your systems, extinguishing them and acting to close down both ends of the machine if required. Ember detectors are well-suited to detecting fires on moving production lines, where just one overheated item could contain enough energy to start a fire and travel the length of your plant. Ember detectors work on a much subtler level than flame detection systems, as the heat required to start a fire isn’t always enough to trigger flame detectors. For example, and overheated, sparking battery may not trigger flame detectors until it has started a fire. Ember detection systems would detect the battery and act before a fire started. Addressable linear detection methods use linear heat detection cables to detect heat throughout an area and trigger fire suppression systems accordingly. Durable and easy to maintain, these cables are suited to particularly confined areas where alternatives would struggle to fit. Unlike traditional heat detection systems, which detect an area reaching a specific temperature, rate of rise heat detection systems detects rapid rises in temperature over a short period of time. This allows for operation at a lower fire condition temperature than standard heat detectors, with the increased sensitivity allowing for faster reactions. All systems are suited for specific applications, and a combination may be required to ensure a complete solution. We work closely with clients, getting to know them and their business to make sure the perfect solution is installed. All our systems are designed to require minimal maintenance to operate at the highest possible level, allowing you to work in confidence and reducing your long-term outgoings. At Fire Shield Systems Ltd, we design, install and maintain bespoke, accredited fire protection solutions. Our team has over 25 years’ experience designing and installing fire protection systems in a wide range of industries. We understand that each business is unique and work closely with you to ensure you have the perfect system for your needs. With Fire Shield, you can always be confident you’re getting the perfect fire protection system. To discuss your needs with a member of our team, call us on 0800 975 5767 or fill in our enquiry form to request a callback.